On Christmas Eve Christians come face to face once again with the inescapable strangeness of our faith. Try as we might to cover it up by focusing on other things; thinking of parties, presents and sweets, shops, malls, and people-packed streets–we just can’t accomplish it. The truth comes out. Do not be afraid; for see–I am bringing you good news of great joy for all the people: to you is born this day in the city of David a Savior, who is the Messiah, the Lord (Luke 2:10-11). Luke does amazing things in this section of his Gospel, in setting up a clear contrast between the greatest of earthly powers, and the power and authority of God. The chapter begins in the very halls of power: a decree went out–literally from the side of–Ceasar Augustus that all the world should be registered/enrolled/taxed. One man. The emperor, who claimed divine privilege and ruled an empire that believed itself the center of the world (as empires usually do). This is power. To announce a decree and have it go out into the whole world–or at least all the parts of the world that counted. Luke takes us from the seat of imperial power and traces the lines of authority. This command went out when Quirinius was governor of Syria. So great is the power of the Emperor that because of his declaration, “all went to their own towns to be registered” (Luke 2:3). This is authority. The emperor says jump and the people of the empire say “how high?” There were even inscriptions in honor of Augustus that praised him as a savior “who has made war to cease and who shall put everything in order” (NJBC p. 683). But something else is happening here. Joseph is brought to our attention. Joseph, a simple man. But maybe not completely so. He is traveling to his ancestral city, Bethlehem, the city of David, the legendary King of Israel. The associations called forth by the mention of King David, of the house and family of David are strong. Whenever these names start being thrown around, it’s a sure sign that something related to Israel’s future is transpiring. So Joseph, a descendent of David, comes to David’s city. Unlike Augustus, he has no power or authority to speak of. He can’t even get a room in the inn for his pregnant bride, Mary. He is not a man who makes decrees. But he doesn’t have to. He and Mary are faithful and Jesus is born in Bethlehem, in a manger, according to the word and decree of God Almighty. 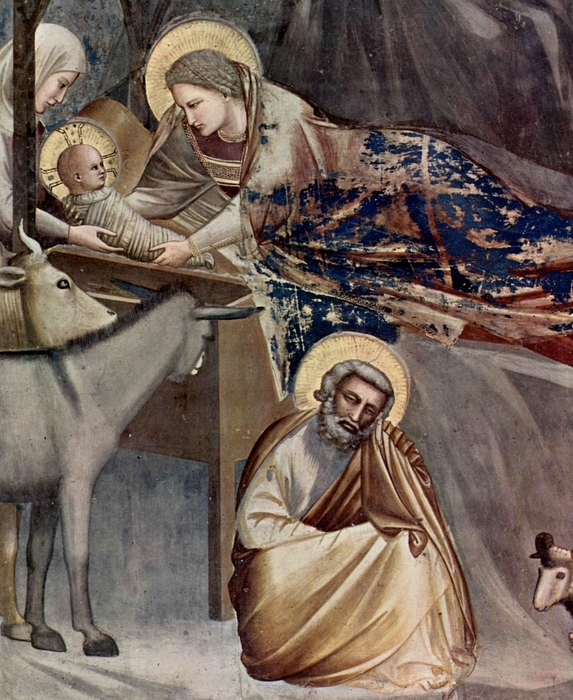 With Christ’s birth, far away from the center of political power, a different sort of authority is exercised, and the Angels of God–his messengers–appear not to the great men of the age, but to simple shepherds tending their flocks. This is a different sort of proclamation, with a different sort of authority. And the good news announced to those shepherds; simple people, representatives of all those who great people presumed to use as pawns, to manipulate and oppress, was a challenge to the claims of Caesar. Not a challenge to his earthly rule, but a challenge to the presumption of claiming to do things which only God can do. Bringing order may lessen the occurrence or brutality of war, but it certainly doesn’t end it; and may only result in greater effectiveness at the task. No. Caesar cannot end wars. The people of the day may have believed that it was Augustus who would put everything in order, but those who hear the story that Luke shares, know that it was not Augustus and is not any of those who claim such authority today who can make such promises or hope to live up to them, but that it is instead the babe born in a manger, with livestock bearing witness, who offers true peace, and true salvation. This is why, when the Angels had given the shepherds their message, suddenly the Heavenly Host–the Angelic Armies of God–appear in the night sky and declare peace rather than war. In Christ, God has declared peace with humanity, and in Christ, we can be truly at peace with God. So tonight, we cannot hide from the strangeness of our faith–that God sought us out in the form of a little child. That the ruler of the universe was born in a stable to a young woman of flesh and bone. That the Almighty was once a little baby without ceasing to be God. That as a babe he needed the care of his mother and the protection of his father. And that as God he offers us salvation. Tonight, on this eve of the anniversary of his birth as one of us, we celebrate his purpose for all of us. And that is a truth, no matter how anyone might try bury or ignore it, that comes through loud and clear. Tonight we take up the declaration of the Angels all those years ago: “Glory to God in the highest heaven, and on earth peace among those whom he favors.” Amen.